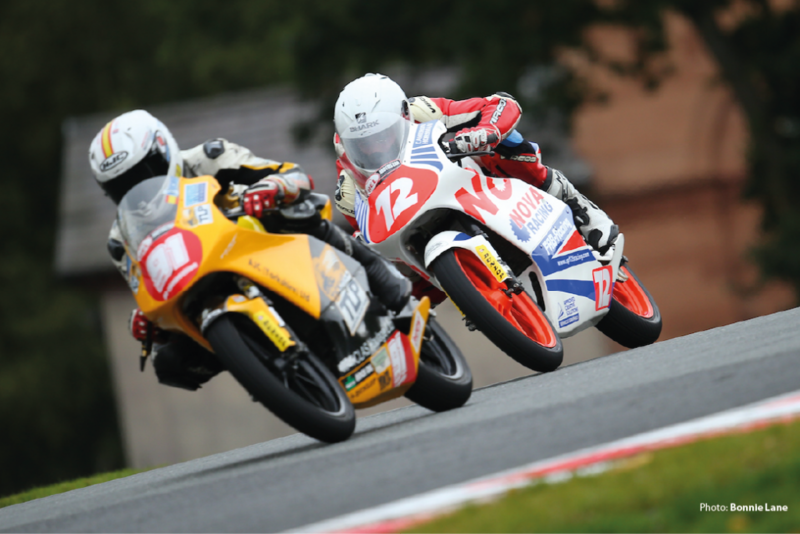 Forest Hill motorcycle racer Cameron Horsman completed another successful round in the Hel Performance British Motostar championship. On Saturday he crossed the finish line in 6 th place whilst on Sunday he went one better finishing fifth. Both free practice sessions took place in the rain. In free practice one it was so heavy few riders spent much time on track. In free practice two Horsman braved the weather and no one completed more laps. He finished seventh overall. Thankfully the weather improved for qualifying. The track was damp initially but dried as the session went on. Cameron Horsman improved almost every lap and set his best time, a 1:51.709 on his final lap. It was good enough to put him fourth on the grid in the standard class. As the riders set off on their warm up lap for the 12 lap race it began to spit with rain. race started the rain began to fall harder and it was red-flagged before a lap was completed. After a short delay to allow the riders to switch to wet tyres a shortened 10 lap race was underway. The three leading riders managed to make a break at the front but Horsman was right in the middle of the chasing group. 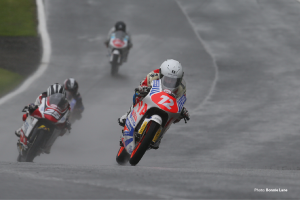 Horsman was able to keep pace with the soon to be crowned Moto3 Champion throughout the ten laps They were in a three-way battle for fourth position. In a tight finish he crossed the line in sixth place. Horsman started ninth for race two but lost a couple of paces on the opening lap. He quickly gained his composure and made up three positions on lap two. Horsman then continued to pick off riders and his worked his way back through the field. Having been 11 th at the end of the first lap he started the final lap in sixth place. He still had time to pick up one more place as he went on to cross the line in a fantastic fifth position. Cameron Horsman is in sixth position in the overall standings on 172 points. 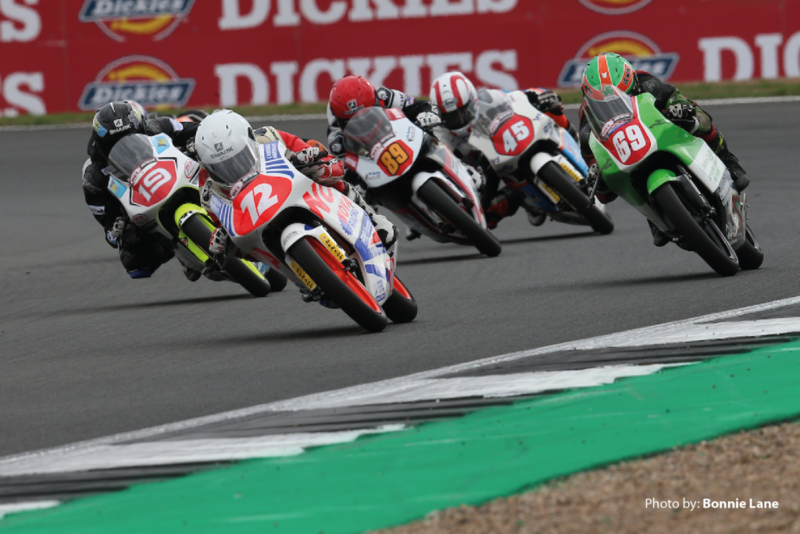 The next race in the Hel Performance British Motostar series is not until 12 -14 October. In the meantime, Cameron Horsman will make the short trip across the sea to Holland for the next round of the British Talent Cup at Assen on 28-30 September. 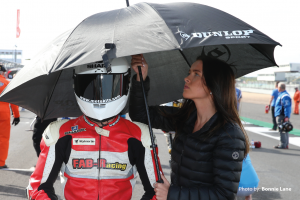 17-yer-old motorcycle racer, Cameron Horsman had another successful weekend in the Hel Performance British Motostar Championship. The rider from Forest Hill was competing in round seven of the standard class championship on his Honda NSF250R. Horsman missed out on a podium in both races by just four-tenths of a second. In race one he finished fourth but because race two was even closer between the riders he finished seventh. Horsman is now sixth in the championship standings with two races to go and only nine points behind the rider in third, so competitive is the series this year. The organisers had decided to run the races on the short national circuit at Silverstone rather than the GP circuit. This was in an effort to avoid the problems experienced with the MotoGP event earlier in the month. The FAB Racing rider spent the first free practice session learning the 1.6-mile national circuit finishing ninth at the end. In free practice two the team made some adjustments to the bike and Horsman finished seventh quickest. There was drizzle during the 30-minute qualifying period on Saturday morning. Usually good in tricky conditions Horsman was unable to take advantage this time finishing the session ninth. However, qualifying was very competitive with little to choose between the riders. He was certainly on a similar pace to the others in the standard class. Saturday afternoon and the 34 combined GP and standard class riders lined up on the grid at Silverstone for the first of the two races this weekend. Horsman had a fantastic first lap making up four places to move into the top five and the leading group. He battled for the full 18 laps making it to third position at one stage before finally crossing the line in fourth. straight they could pull a gap over the standard riders but through the corners Horsman and the other would be backed up behind the bike. It perhaps also held the group so closely together because as Horsman crossed the finish line he was again 0.4 seconds from third place but so tightly packed were the riders he was classified seventh.